A Japanese music and culture social media network project with a focus on Jrock and Visual Rock promotion throughout North America. Let me tell you a little story about the most colossal weekend ever. Okay, admittedly, it did not start out so colossal. As you may or may not be aware, the weather in central Texas has been absolutely horrific. Dangerous thunderstorms and flooding have been plaguing the entire central corridor for the past few weeks, but I wasn’t about to let that stop me from seeing what is, in my opinion, one of the best bands in the visual kei scene. That’s right. I picked this god-awful time to make the long trek from Austin to Toronto to see Matenrou Opera appear at Anime North. What could possibly go wrong? An almost eight hour delay and two missed connections later, I finally arrived in the beautiful city of Toronto, Ontario and met up with fearless leader Lizz. She had just finished her interview with the band and, despite my extreme travel fatigue, I found myself buzzing with excitement. The show couldn’t come soon enough. It seems I wasn’t the only one who felt this way. We arrived at Anime North the next day around noon to find some die-hard fans already lining up at the door. We joined them a few hours later where we were invited to sign a Canadian flag they had prepared as a gift to the band. We chatted with a few of the fans and the overall feeling was one of love and excitement. Matenrou Opera to Perform at Anime North 2016!! Are you excited? We’re excited! Making their Canadian debut this year at Anime North, Toronto, Matenrou Opera will be performing live Saturday, May 28th. The concert is free to attend with convention pass, so be sure to grab yours asap! Weekend passes are almost sold out, and day passes sell out shortly after that. So don’t delay! We expect to see you all there! SATURDAY AND WEEKEND PASS HOLDERS ENTER FOR FREE. We had the chance to sit down with UchuSentai:NOIZ right at the beginning of Anime North this year. It was a pleasure to speak with them again, having last seen them at their performance 2 years prior. The interview was set as a small press conference consisting of myself, Satty from CJLO’s Shibuya Crossing and Dianna from Beachboosterradio’s Beach Corner. Please watch for all our coverage on our blog: Lots more to come! 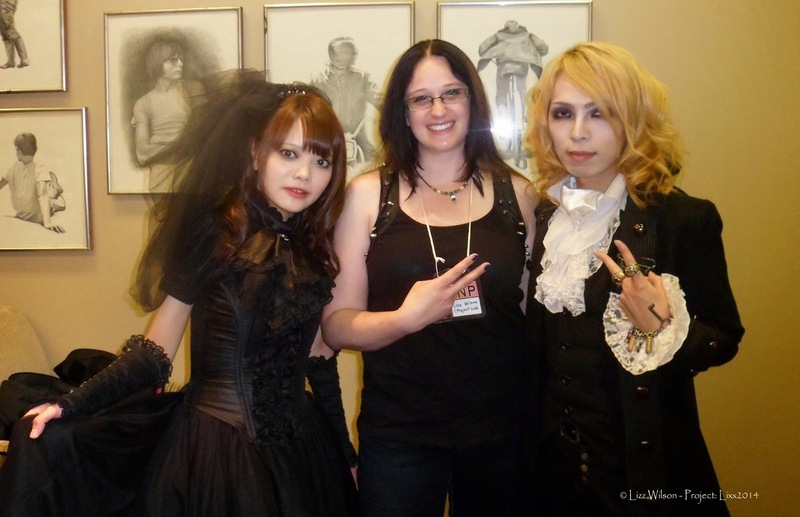 Amidst the chaos of convention life, both Rose Noire and DaizyStripper were kind enough to sit down with me prior to their lives at Anime North. Both bands were present during the interview, so the conversation will bounce between both bands. Enjoy!